BANGI, 6 Dec 2012 – Current and former students of The National University of Malaysia (UKM) students liven up the university’s Deepavali Celebration at the Banquet Room in the Chancellery here this afternoon with colourful dancing and singing. 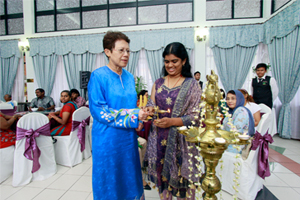 Kicking off the ceremony was the lighting of an oil lamp, ‘the Kuthuvilaku’ by both the Chairman of the University Board of Directors, Prof Emeritus Dato’ Dr M Zawawi Ismail and Vice-Chancellor, Prof Tan Sri Dato’ Wira Dr Sharifah Hapsah Syed Hasan Shahabudin. It was also attended by two Deputy Vice-Chancellors, Prof Ir Dr Othman A. Karim (Students & Alumni Affairs) and Prof Dato’ Dr Saran Kaur Gill (Industry & Community Partnerships). Seven artistic performances were rendered highlighting the intricate detail and elegance of traditional Indian dances. A recent graduate in Linguistics Studies from the Faculty of Social Sciences and Humanities, Jamuna Rani a/p Mogan performed two classical dances while third year Mass Communication student from Faculty of Social Sciences and Humanities (FSSK), Ratchurathan a/l Rawe Shanggan dance the classical “Bharathanatyam”. A third year English Literature major Abigail Lucas sang ‘a cappella’ style song with Qurratu Izyan Nadzarein Shah a student from FSSK sanging Adele’s “Someone Like You” while first year student Muhammad Rizan Mohd Hanifah from the Faculty of Information Science and Technology (FIST) performed two songs. 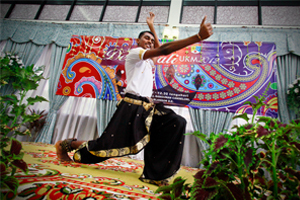 Muhammad Rizan then joined Suntharesan a/l Bacakrishnan, a third year student from FSSK, Lovina a/p Yogarajan from the Faculty of Economics and Management (FEP) and Laviania a/p Pathmanathan from the Faculty of Law (FUU) for the “Kolaattam” dance, an Indian folk dance which uses sticks.